How many of us actually read TONS of such inspiring articles… but the moment we step away from our laptop (or whichever device you used to read the articles), those inspiring thoughts are relegated to the “forget-n-move-on” bucket. Yeah I know… that’s why every year – like lemmings – we return to reading similar inspiring articles again. LOL. So instead of losing the lessons behind this great article, I’ll do something different this time. I’ll write about each of the 60 tips, how I live or breathe them, or my challenges in implementing or keeping them, and how they change (or not) my life for the better. I’m sure if I adopt this approach even if I can’t own all the 60 tips, I would have improved myself a step or two come end of this year. Alrite, let’s get to the 1st tip in the series – EXERCISE DAILY. Oh…. hmm. Those who knew me personally would know I run often and regularly takes part in 10K races. I hit the gym 2-3 times a week, mostly to run on the treadmill though on Sundays, we would prefer to run at one of the local parks – KLCC park being our fave. With time being a premium for me, I spent mostly 1 – 1.5 hour at the gym and covers 8km-12km whenever I hit the treadmill. Even in races, I only do the 10K distance (and have not graduated to a longer 21K or the full, and have no desire to do so). My timing for the 10K distance is ok la with a comfortable sub-55 min for a desk jockey runner like myself. The main reason for running is to help myself maintain a high energy level in order to achieve all the other backlogs of stuff from my work and business. While I’m pretty sure I’m active enough on those days I run – be it on the treadmill or in the park – it’s in those days where I do not run that I felt I’m not yet doing this “Exercise Daily” step properly. And if that’s not enough to prompt me into action, this video “Office Posture Matters: An Animated Guide” and this article “Sitting: Hazardous to your Health” postulated that even an hour of sports or exercise daily is not sufficient to compensate for the obscene amount of time we spent sitting (or sedentary) the rest of the day. Mind you, those hours we sat on our bum while commuting to and from work are part of the “sitting time” ya? Not to mention the time we sit when we are having dinner, when we watch TV, when we read newspapers, when we catch-up on our Facebook…. jeez, do we ever NOT sit? We simply need to switch to a more “active” lifestyle during our working – or maybe, waking – hours, which admitedly consumed the majority of our 24-hours. The first step is to be able to quantified how “active” we were in the day. That’s where I thought one of these recent trendy pedometer gadget would be useful. The Fitbit Force – the latest from Fitbit’s list of successful fitness tracker just fits the bill! I liked the Force becoz it does two things not all fitness trackers do which are to track stairs climbed and also your sleep pattern. This article is not a review of Fitbit Force (I might write one some time) so I’ll skip why I chose the Fitbit and instead focus on how I’ve changed my daily pattern into a more active one ever since I put the Fitbit onto my wrist. Even without the Fitbit, I tend to walk a fair bit more than the average person (or so I thought). For eg, I usually park at the far end to my office lift. Well, the fact that I’m usually not early into the office makes the far end an easier place to find parking spot. Parking on the far end means I take a longer walk to the office lift. So that must be good, right? One of daily goals the Fitibit sets for you is to walk 10,000 steps. At this point, you are either stunned into disbelief (can anyone walk 10,000 steps everyday?) or felt it’s too easily achievable (ie you thought you are already doing close to 10,000 or so steps every day). I kinda fell into the latter category. If you’d asked me before I’d bought the Fitbit, I would have replied thinking I was doing 5,000 – 7,000 steps a day. I only had the Fitbit a week plus and I set the first few days very much as an info-gathering period without changing anything to see how much “walking” (or stairs-climbing) I would normally do in a typical day. And guess what? My average steps was just around 3,000-ish steps daily based on my usual routine. Keeping to Fitbit’s 10,000 steps would mean I need to be 3x more active! Even though I live in a double-storey house, I would guess the number of floors I climbed would amount to no more than 3-4 per day. Fitbit’s daily target is 10 floors. Phew. The benefits of integrating the stairs into your exercise routine are well-documented. It’s just that most ppl dun do it, including myself. Well, looks like Fitbit is helping me to change that. I usually park at basement three (B3) and takes the parking lift to Ground Floor. What I’ve changed now is to jog up the four flights of stairs every morning. And also during my lunch time. I can do that in about 43 secs now so I suppose that might be faster than waiting for the lift? I also take the longer walk to get food during lunch. Or whenever there’s walking opportunity, I’ll just grab it. For eg instead of taking a direct route to the café, a longer 10-min detour can clock up the extra steps and also afford me some quiet time for reflection during the walk. Let’s see how the changes I made are tracking in Fitbit. The Fitbit Activity Summary page below (from my Lumia app) tells of a typical day at work (on days when I do not run at the gym). Not too bad and as you can see I’ve improved from the 3,000 steps but there’s still some work to do to close the 10,000 steps goal – and also need to improve the Active Minutes to >30 each day. However on an “Active” day which is a day where I drop into the gym for a good run on the treadmill, my Fitbit Activity Summary page looks much better (see below). The extra steps were based on a 9K run and on that day, I did the office parking basement stairs twice – once in the morning and the 2nd time during lunch. Note: The 18 floors done was becoz I also ran up the flight of stairs at the gym 4x in-between my runs. While Fitbit has indeed helped me to raise my daily level of “activeness” and keep to the spirit of “Exercising Daily”, I still have some gaps to close to ensure I can tick off the daily target of 10,000 steps and 10 floors consistently especially on weekends. It’s interesting though that Robin chose this as his first of the 60 tips to a great life. I do fully agree with him and while I do not see keeping fit as an end-goal by itself; it’s an important goal to keep myself match-fit so that I have the right energy level to complete the other goals of mine. What are my next Active targets? My next goal here would be to skip the lift to my office (located on the 7th Floor) and simply take the stairs all the way up the 7 flights of stairs. And after that, to go all the way from the basement car park to 7th floor for a great 11 floors climb in the morning? LOL. 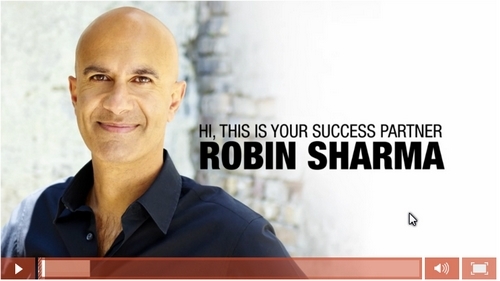 I’ll end this blog by leaving you with the link to Robin Sharma’s “How to unleash your greatness in 2014” video. May this change your life into a great life!